Just in time for your parade-going, rally-attending festivities, J.Crew and sister company Madewell have released a new collection celebrating LGBTQ Pride Month. 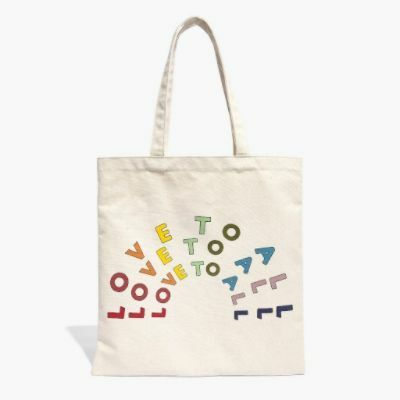 The collection, which includes “Love first” tees for adults and kids, socks, and a very cute tote bag, has been produced in cooperation with the renowned civil rights organization Human Rights Campaign (HRC). 50% of the purchase price of any collection piece will go directly to HRC, which works to ensure LGBTQ people are safe, equal, and free in every community. The accompanying marketing campaign is fronted by a diverse group of people who will be very familiar to those who follow the fashion blogosphere. 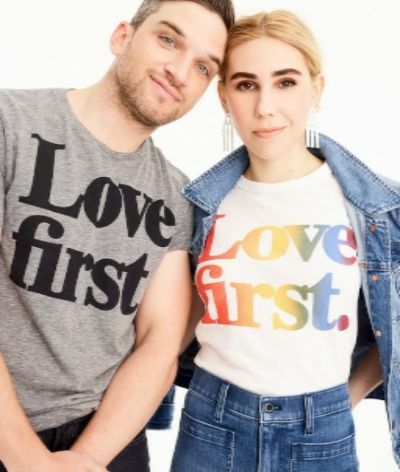 Actor and advocate Zosia Mamet (posing alongside her actor husband, Evan Jonigkeit) is joined by InStyle editor Sam Broekema and menswear-as-womenswear blogger Allison Graham, amongst others. A signature ‘Love first’ tee will set you back $34.50, while socks are going for $14.50, and the Madewell X HRC tote is selling for just $10.00. The entire collection, including both J.Crew and Madewell items, is available for sale on the J.Crew website. → Buy the J.Crew X HRC Collection, $10.00 & up, at jcrew.com.